Did you know what’s even scarier than a pimple? It’s that gray hair sticking out of your messy bun, reminding you of your growing age, when in reality you are just in your 20’s. Agreed right? It can be a painful sight having to look at gray hair when you are not even at the age of it. It to get rid of them can be a real pain. There could be several reasons leading you to the loss of melanin that gives your hair the colour they are in. The decrease in melanin production turns the hair gray. And it’s not shocking to see young teenagers having gray hair and feeling bad about it. But like everything has a solution, this thing too has a cure. If you are thinking I’m going to suggest you a couple of ointments and supplements, then you’re wrong. Natural remedies are our best friends and are always here to help us with everything. They are safe, they show results and have minor to no side effects. First, heat a cup of coconut oil in a pan. Add curry leaves to this and switch off the fire. Cool this down a little and massage the oil into your scalp for about 15 minutes. Leave it on for 2-3 hours or even overnight. This is the first Ayurvedic home remedy. You can also store this oil in a jar. But ensure that the curry leaves are completely immersed in the oil. Wash your hair the next morning. Repeat this treatment for gray hair cure every week and see the remarkable difference in your hair colour. This will help you turn gray hair to black naturally. This is the best Ayurvedic home remedy for gray hair. Make a hair pack with henna and two teaspoons of Amla powder. Mix them well with a little water to make a thick paste. 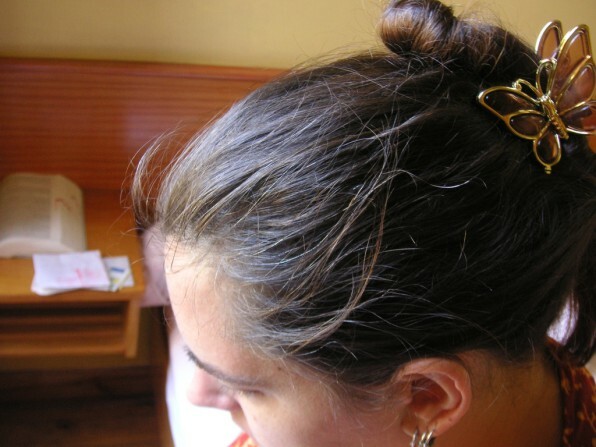 This is a simple gray hair cure for you. Apply this pack onto your hair. Leave it on for 3-4 hours and rinse with cold water. Your gray hair immediately gets covered up with the colour of henna. To give a darker shade to your hair, you can also add some coffee powder to the paste. The Amla powder is a super useful home remedy for gray hair. In addition to this Henna(Mehndi) is a natural hair colour. Squeeze the juice of a few lemons depending on the length of your hair. Mix it with coconut oil and massage this solution mixture into your scalp and hair. Leave it on for about an hour. Rinse with cold water. Repeat this treatment every week and notice your hair becoming darker. This home remedy helps to turn your gray hair to black. These are some the best Ayurvedic home remedies gray hair which helps in covering & reversing natural colour of your hair. The colour of tea and coffee works as a natural dye for hair. In water, add tea or coffee and boil for 10 minutes. Rinse your hair with this water to get a natural colour and shine in your locks. The therapeutic remedy of Aloe vera gel assists in controlling premature graying of hair. In the pan, take 60 grams of henna and 250 grams of mustard oil. Boil them together till for a long time. Apply this mixture on your hair once in a week to see results. Black pepper is also a good option for curbing gray hair. Mix 1 gram black pepper powder with ½ cup curd and massage it onto your hair. Leave it on for half and wash. Repeat this once a week to see results. Whether you are a young teen in your twenties or a middle aged man, you have all rights to flaunt your natural black hair and love them for that. Grey hair can be a unpleasant site and can be heart wrenching. So switch to these home remedies to regain the colour of your locks and flaunt them. Natural home remedies, though very effective, can take long to show results. But they are no doubt worth the wait.